Hillary will never admit she is a liar even when she is caught red handed in a lie. That’s what liars do. They lie no matter what the consequences are. Judge Andrew Napolitano said that Hillary Clinton continued to “maintain the facade that she’s been telling the truth” in her “Fox News Sunday” interview. He explained that to send, receive or open those items, Clinton would have had to enter a continuously changing alpha-numeric code. 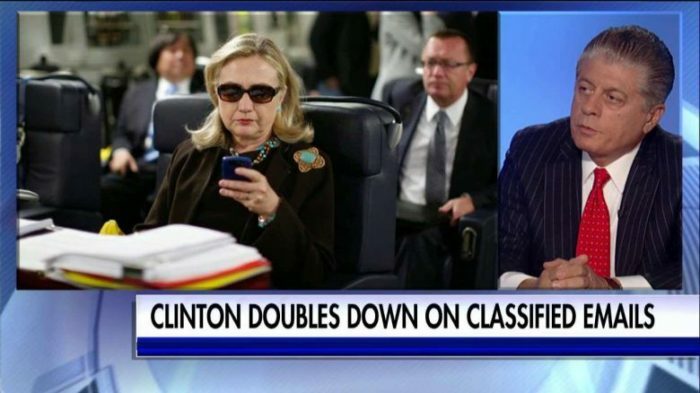 Judge Napolitano said that as secretary of state, Clinton also had the legal obligation to recognize classified information whether or not it was marked. Get more insight from the judge above.